We have all gotten those plain text emails from other people’s iPhones in the past. 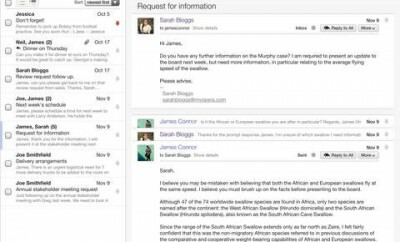 While there is nothing wrong with those, sometimes you want to go beyond text and send full HTML e-mail to your contacts. That’s where Markdown Mail comes into play. It provides you with an easy way to compose HTML e-mails without too much hassle. 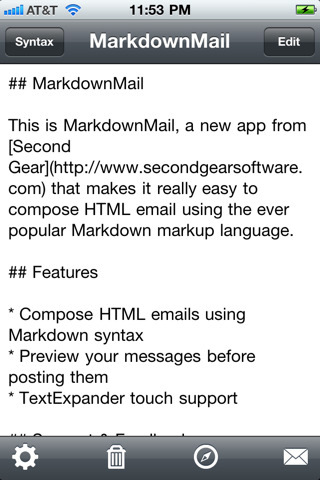 This app is based on Markdown markup syntax. As long as you follow its simple rules, you should have no trouble adding HTML elements to your e-mails. It does allow you to preview your HTML messages, so you’ll know if you have made any mistakes. Its TextExpander support is a plus. The app has a lot of potential. For starters, it makes sending HTML emails so easy. It’d be nice if advanced email features are added to it though (e.g. draft support). The good news is Markdown syntax is pretty easy to learn and use. 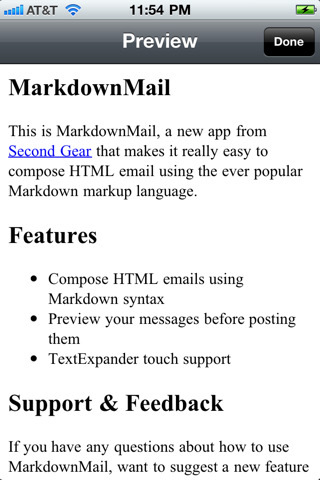 This is a pretty useful app if you want to send HTML emails from your iPhone.